Posted on Monday, June 10th, 2013 at 6:05 am. 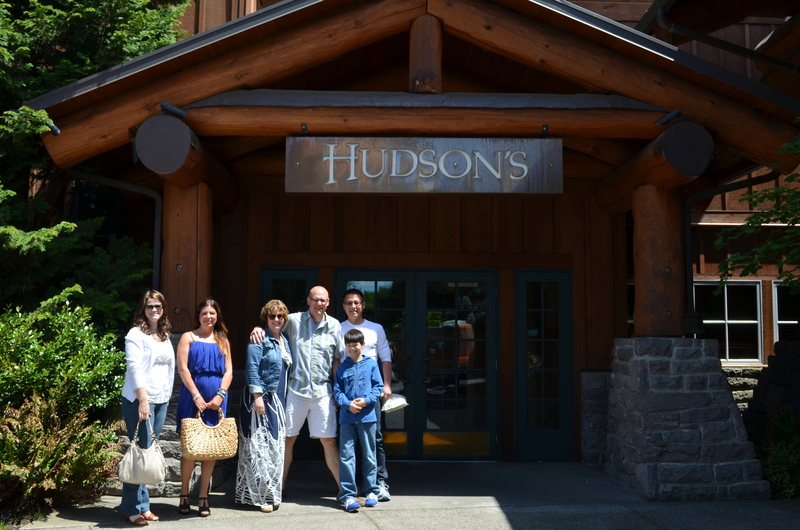 Hudson’s Bar and Grill occupies the northwest corner of Vancouver’s rustic, mountain-like retreat, Heathman Lodge. 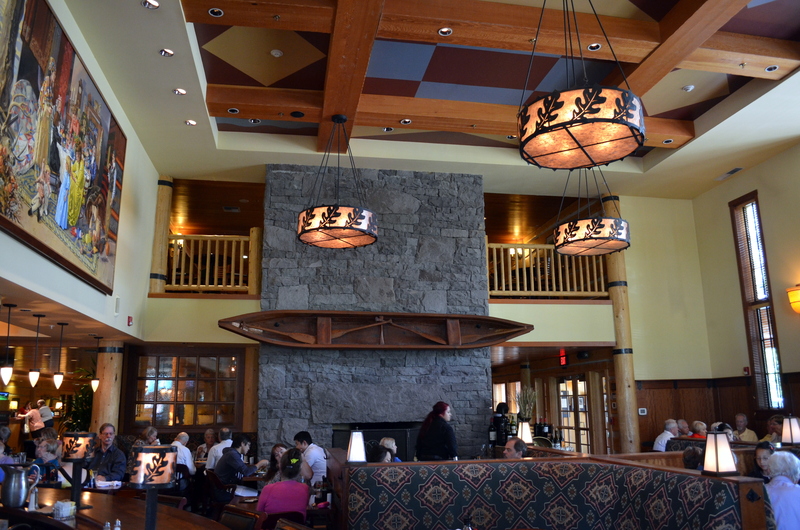 Massive logs, vaulted rock fireplaces and charming lights adorn Hudson’s inviting and cavernous dining room. On the north wall, an interesting mural depicts the Columbia River valley, its native inhabitants and a sort of thanksgiving theme with newly arrived settlers. What’s your interpretation? Before we get to the main event, I’d be remiss if I didn’t provide you with some “brunch candy”. 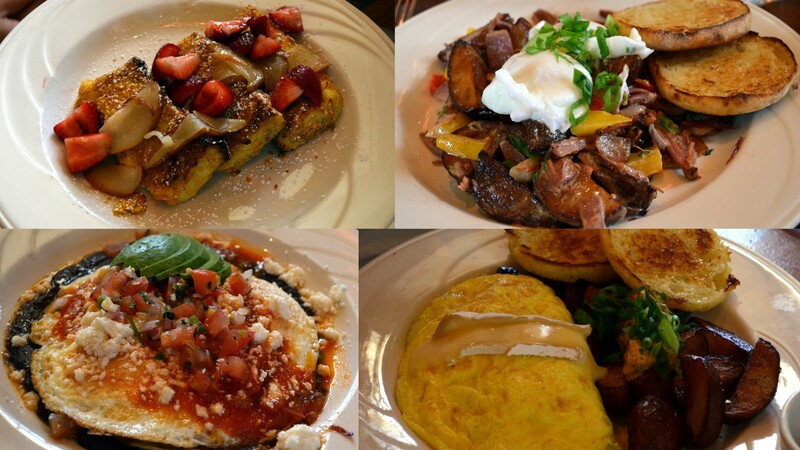 Starting clockwise in the upper left, Crispy Bread Pudding French Toast, Hudson’s Corned Beef Hash, Roasted Wild Mushroom & Brie Cheese Omelette and Huevos Rancheros. Mary’s analysis of the Crispy Bread Pudding (major flavor bomb) was that cornflakes were used to create the crusty goodness. Whatever Hudson’s uses, we’re fans! One bite of Hudson’s corned beef was all I needed to confirm what locals have known for years – corned beef is made in-house! That tasty morsel was succulent, flavorful, tender and not too salty. 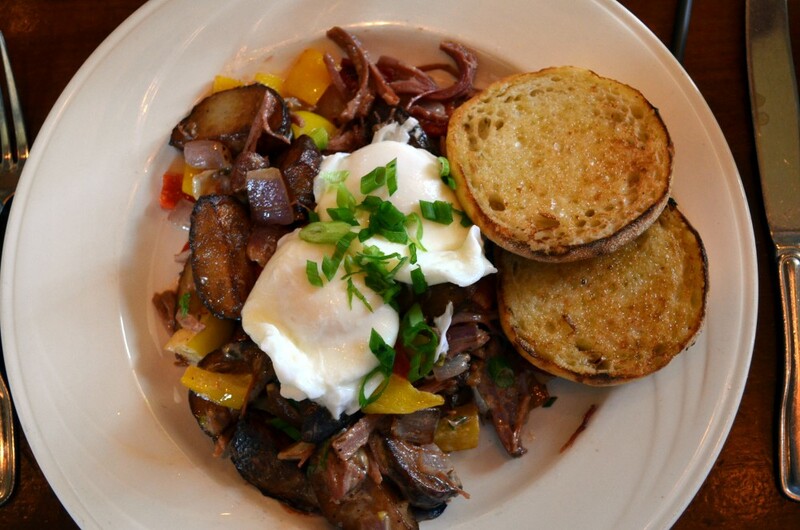 In fact, it reminded me of the brined corned beef Brandie and I made for National Corned Beef Hash Day. Combined with the roasted potatoes, chunky yellow and red peppers, sweet red onion and poached eggs, this CBH is one of the best I’ve tasted! Thanks to my hashcapade crew: Cristina, Cory, Mary, Brandie (thanks for the Hudson’s recommendation), Hiro, and Tony. Special thanks to the smiling and helpful Rachael who kept the libations and hash info coming!